Regular council meetings are held in the City Hall on Tuesdays, Wednesdays and Fridays at 10 am except on holidays or if decided by special resolution. A current annual (July to June) schedule of all Council meetings, broken down by committee, is available as a .pdf download from the Office of the City Clerk. Los Angeles was governed by a seven-member Common Council under general state law from 1850 to 1889, when a city charter was put into effect. Under the first charter of the city, granted by the Legislature in 1889, the city was divided into nine wards, with a councilman elected from each one by plurality vote. The first election under that system was held on February 21, 1889, and the last on December 4, 1906. Two-year terms for the City Council began and ended in December, except for the first term, which started in February 1889 and ended in December 1890. The term of office was lengthened to three years effective with the municipal election of December 4, 1906, which was the last year this ward system was in use. Regular terms begin on July 1 of odd-numbered years until 2017 and on the second Monday in December of even-numbered years starting with 2020. 1951 Earle D. Baker Charles Navarro John S. Gibson, Jr.
1973 David S. Cunningham, Jr.
^ "Directory". LA City Council. Retrieved 14 July 2014. ^ "Los Angeles City Council salaries come under attack in council races". dailynews.com. 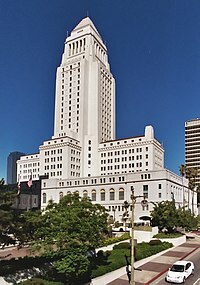 ^ "Los Angeles City Council". LACity.org. 2009-01-01. Archived from the original on 2010-04-11. Retrieved 2010-04-13. ^ "Former L.A. Councilman Greig Smith tapped to fill vacant seat until election".